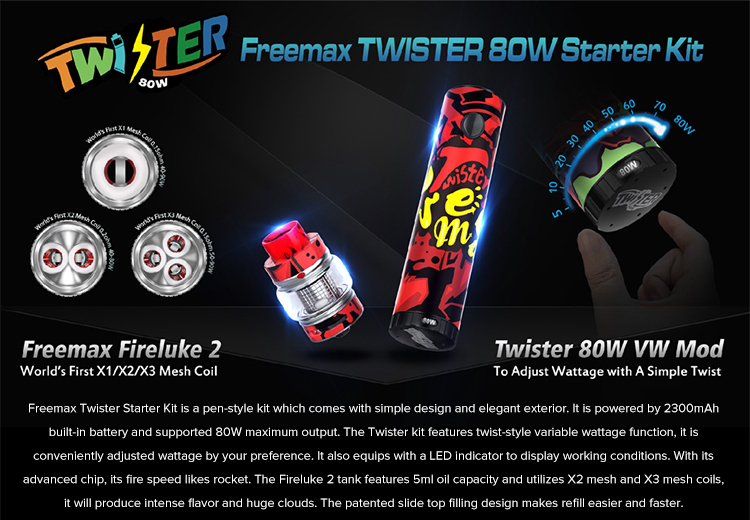 Freemax Twister Starter Kit is a pen-style kit which comes with simple design and elegant exterior. It is powered by 2300mAh built-in battery and supported 80W maximum output. The Twister kit features twist-style variable wattage function, it is conveniently adjusted wattage by your preference. It also equips with a LED indicator to display working conditions. With its advanced chip, its fire speed likes rocket. The Fireluke 2 tank features 5ml e-juice capacity and utilizes X2 mesh and X3 mesh coils, it will produce intense flavor and huge clouds. The patented slide top filling design makes refill easier and faster.